A colony of Fawn leaf-nosed bats. See if you can spot the pups! (Hint: older animals have bleached fur. Photo by Dave Bennett at Wikimedia Commons. Hi everyone! I hope you all had a good week. I went back-to-school shopping. It was fun to buy new clothes for school. The people in Indonesia haven’t been having such a great week. There was a really bad earthquake there. I decided to learn about a bat from Indonesia. I found an adorable bat called the Fawn Leaf-nosed bat. They got their name from their leaf shaped nose. Their nose narrows at the front to make their leaflets more visible than those of other leaf-nosed and horseshoe bats. Another distinguishing feature this bat has is their big ears. Fawn Leaf-nosed bats have adorable triangular ears. They have grayish-brown or orangey colored fur. Like most other bats, these guys eat yummy crunchy insects. They especially like moths and beetles. 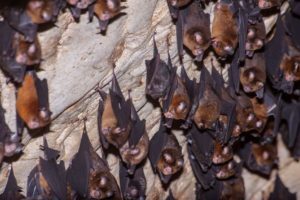 Fawn Leaf-nosed bats roosts in caves and abandoned mines. They also take shelter in sheds and other buildings. They live in areas close to water, such as rainforests and open Savannah woodlands. These bats range from Southeast Asia and Melanesia to the Coen region and Cape York. If you want to read more about these bats you can do so here. Previous StorySomething promising for little Lucys?